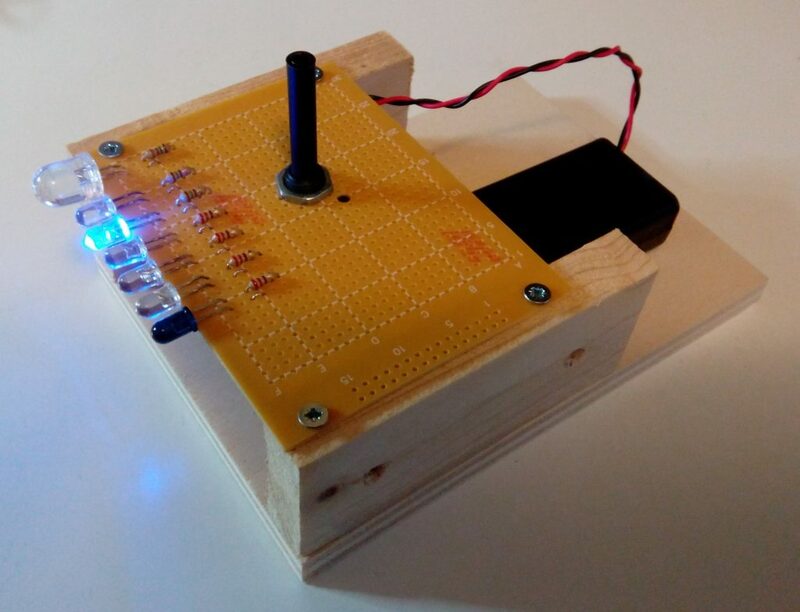 In this post we propose the construction of a diffraction grating spectrometer based on webcam and software Theremino Spectrometer. 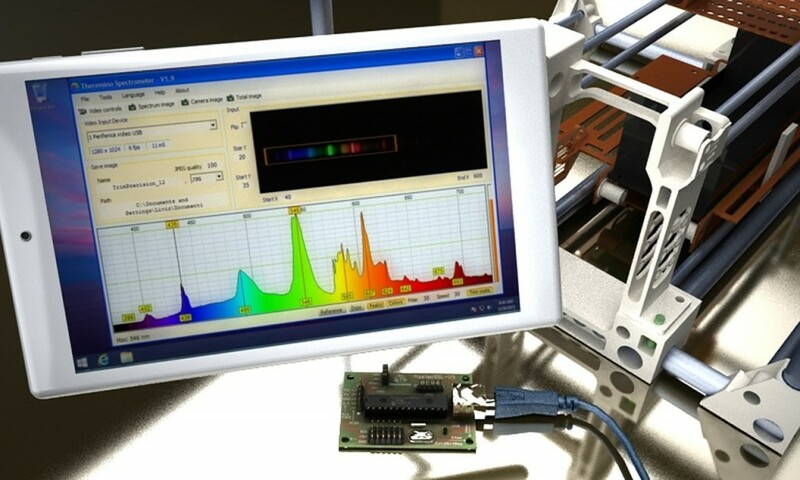 The spectrometer is a fundamental tool that allows measurement of the spectrum of a light source, ie the properties of light as a function of its wavelength. 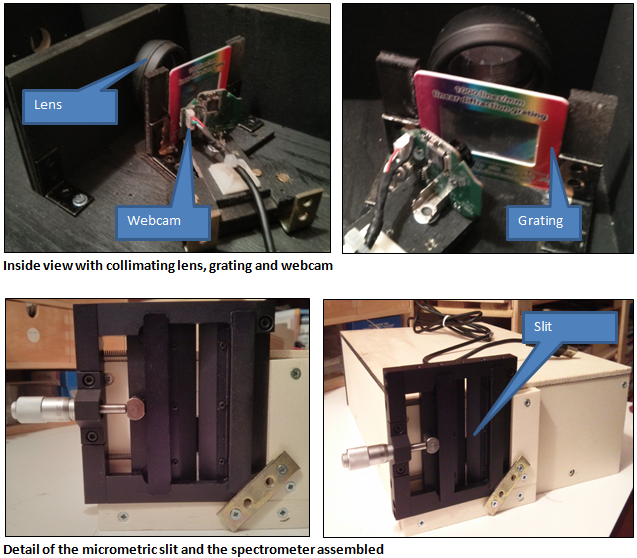 The spectrometer that we propose uses the principle of interference in a diffraction grating in order to decompose the light radiation in its wavelengths and subsequently measuring its intensity with a high-resolution webcam. 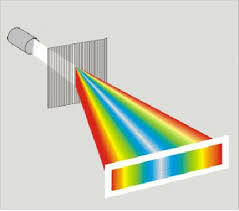 A monochromatic light beam that is incident on a grating gives rise to a transmitted beam and various diffracted beams, at angles that depend on the ratio between the distance between the lines of the grating and the wavelength of the light. 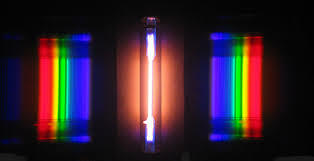 So, if the light beam is composed of multiple wavelengths, the decomposition of the beam into its components is obtained. The light with a longer wavelength is deflected to a larger angle with respect to the incident direction (angle of diffraction ) . For each wavelength more rows can be observed. 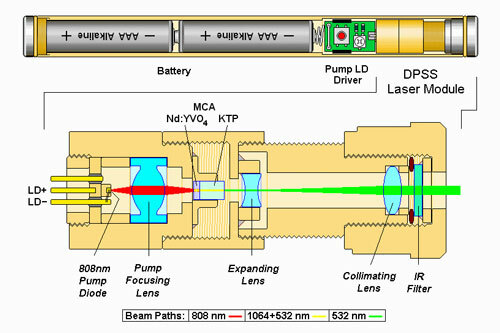 The number of rows that are counted from the middle line, which is not skewed with respect to the incident beam and is taken as a reference , it is said “order” and is often denoted by the letter m.
In the image below there is the 532 nm green laser diode functioning scheme. 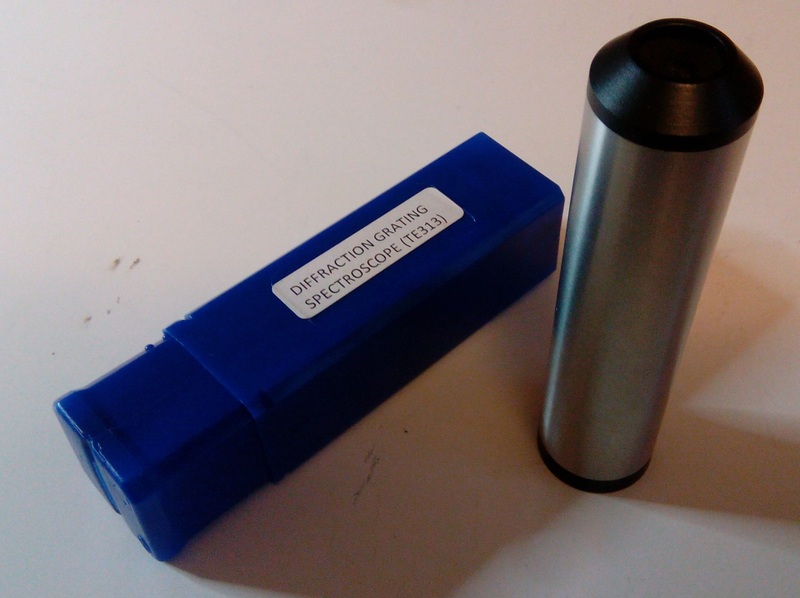 There is IR pumping emission at 800 nm. Nd:YVO4 crystal converts this wavelength into 1064 nm emission, the latter is frequency-doubled, at 532 nm, from a KTP crystal. 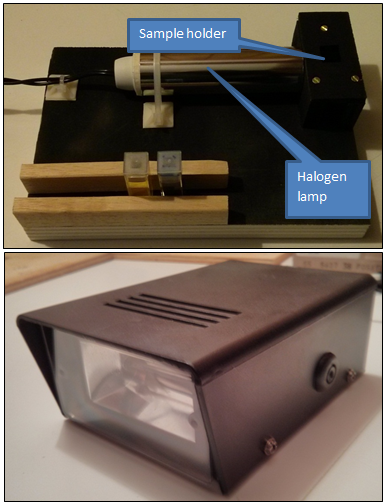 The absorption spectra are obtained by means of an halogen lamp and a xenon lamp with constant emission over a wide wavelength range. The variations in the emission intensity are compensated with a software algorithm. The useful bandwith starts at 370 nm till to 1000 nm. 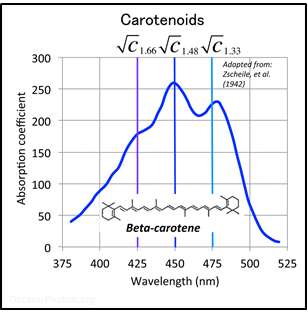 In general, carotenoids absorb wavelengths ranging from 400-550 nanometers (violet to green light). They serve two key roles in plants and algae: they absorb light energy for use in photosynthesis, and they protect chlorophyll from photodamage. In humans, three carotenoids (beta-carotene, alpha-carotene, and beta-cryptoxanthin) have vitamin A activity (meaning that they can be converted to retinal), and these and other carotenoids can also act as antioxidants. Carotenoids with molecules containing oxygen, such as luteinand zeaxanthin, are known as xanthophylls. The unoxygenated (oxygen free) carotenoids such as α-carotene, β-carotene, and lycopene, are known as carotenes. Their colour, ranging from pale yellow through bright orange to deep red, is directly linked to their structure. Xanthophylls are often yellow, hence their class name. The double carbon-carbon bonds interact with each other in a process called conjugation, which allows electrons in the molecule to move freely across these areas of the molecule. As the number of conjugated double bonds increases, electrons associated with conjugated systems have more room to move, and require less energy to change states. This causes the range of energies of light absorbed by the molecule to decrease. As more frequencies of light are absorbed from the short end of the visible spectrum, the compounds acquire an increasingly red appearance. 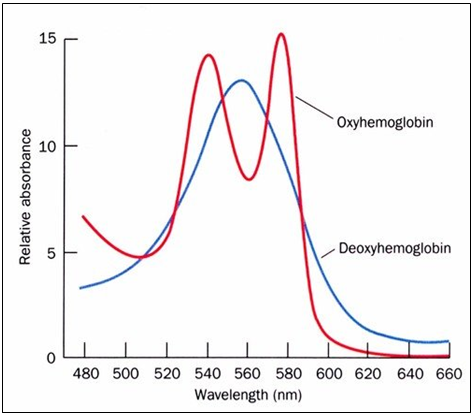 Hemoglobin is a globular protein whose quaternary structure consists of four sub-units . It is soluble, red (is a chromoprotein), and is present in the red blood cells of vertebrates, excluding some Antarctic fish. It is responsible for the transport of molecular oxygen from one compartment with high concentration of O2 to the tissues that need it. Each of its four protein cells, called globin, contains inside a molecule of protoporphyrin coordinating an iron ion Fe (II), located slightly outside the plane of the molecule, collectively called Eme Group. When it binds to oxygen hemoglobin is called oxyhemoglobin, and it is called deoxyhemoglobin in the unbound form.